On the first day of summer, summer arrived. It's been lovely here today and the cold wind has dropped. So I managed to get outside and do a little work in the garden. Let's hope it stays fine for a while, there's a lot to do. I let the last couple of parsnips go to flower and hopefully, seed. Although it's usual to select the best roots for growing on to seed, preserving and enhancing the quality of the next crop, I don't think too much harm will come from saving the seed from these leftover plants from last year. 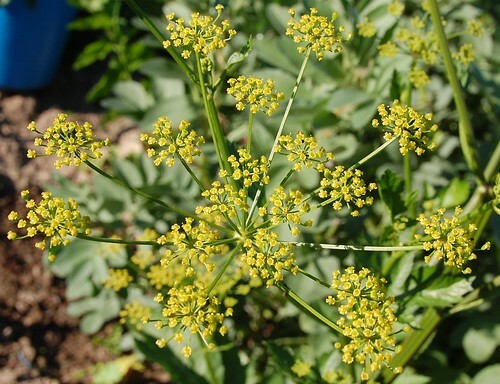 Parsnip seed, like carrot seed has quite short viability. I'm hoping by having ultra fresh seeds we'll have excellent germination when I plant them next spring. Also in the seed saving bed, some Forono beetroots. 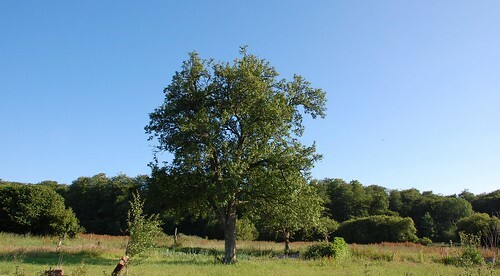 These are the long rooted sort, sometimes described as tankard shaped roots. I'm not sure of their security in the world, Suttons seeds are now offering a variety they say supersedes them and I've not seen them on offer anywhere else recently. Reason enough to start saving their seed at home, I think they're one of the best beetroot available. 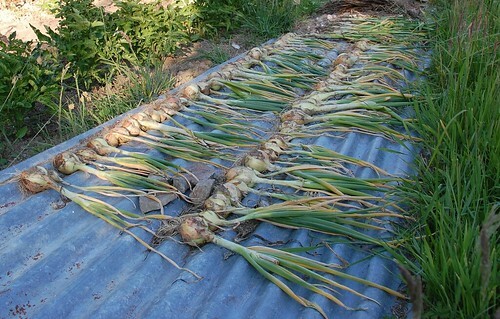 These onions are from sets planted last autumn, an overwintering variety. They've not done too badly although I think the soil is rather impoverished in this back garden bed. I may have pulled them a little early but I needed the space for cabbages. I also took up the Jolimont garlic. Not hugely impressed by these, I was hoping for much larger bulbs. The plants were beginning to succumb to rust so I didn't want to leave them any longer. Still there are one or two largish bulbs and I will save them for planting in the autumn - the rest will be devoured in no time. The other 'special' garlic I bought for this season, called Arno wasn't planted until March. It's still growing well and looks as if it might be more rewarding than the Jolimont, we'll just have to wait and see. The maincrop garlic, that same old redskinned hardneck that came from a supermarket originally is doing its stuff on the other plot. I expect it will be o.k. although the bulbs are never huge. And I'm still all trembling from the scary joy of having a young swallow perched on my finger. An evil cat had caught it and brought it in to despatch and luckily I got there in time. The trouble with saving birds from the cats is that the birds, even if relatively unharmed are so shocked and terrified by their experience it's hard to find a safe place to let them go to recover. The little chap sat quietly in my hand for a moment while I tried to decide which nest was most likely to have been his home when he perked up and trustingly settled on my forefinger. The bird and I surveyed each other for some moments, as I cooed and smoothed his feathers and then, when the adult pair came swooping down to investigate he bravely took off and flew away with them. I hope he's strong enough to learn never to come too close to a cat again. Ooh, onions! I may try my hand at onions this year. I'm growing garlic for the first time and can't wait till it's time to pull it up! This fall I'll tuck some in around our new rose bushes. I've read that garlic helps keep the Japanese beetles away. Japanese beetles sound nasty. I had to look them up as we don't have them here. Good luck with keeping them away.